You may have watched a joust before — presented as a curious spectacle for a local fair, or as part of the entertainment at a kitschy historical tourist attraction. But you’ve never seen jousting as it happens at St Ives Medieval Faire’s World Jousting Championship. There, it is a serious, dangerous, competitive sport, practised with all the pomp and chivalrous ceremony of the jousts that took place more than 500 years ago. I’m a serial attendee of medieval festivals, attracted to the heady mix of bright costumes, historical displays and a cheerful community. But St Ives is different to most. Most notably, the stakes are higher — it’s one of the few jousts where the lances are solid wood and steel, where most include a false tip made of balsa wood or a softer material. Strikes with these lances hit harder, and the possibility of unhorsing is very real — if still fairly uncommon. For people who are used to the spectacularly explosive splintering of balsa wood lances, solid wood jousts may seem a little underwhelming — strikes don’t connect as often, as the lances are heavier and harder to direct. When they do hit, however, the amount of force behind the strike is unmistakable. It’s no wonder it’s been called the ‘original extreme sport’. St Ives’ jousters come from across the world to compete — this year’s competition featured knights hailing from The Netherlands, the United Kingdom, Canada, France and Norway, as well as Australia’s three defending knights. The St Ives Faire program leaves spaces for fans of the joust to collect autographs from their favourites. For a 500-year-old sport, competitive jousting is growing fast. In a world that becomes gripped by Game of Thrones fever for two months of every year, perhaps it’s not so surprising — I overheard more than one jouster being compared to the Knight of Flowers by enthusiastic fans. Despite the sweltering heat of the 35 degree spring weekend, this year’s event seemed larger and more packed with people than I’ve ever seen it. While most of the events in the main arena played to a packed-out crowd, there’s no denying the joust is the premiere event. Of everything that takes place across the weekend, it’s performed with the most ceremony, and utmost care to historical detail. First, St Ives’ resident royalty and nobility file in to take the prime seats in the stands, before the herald begins to introduce each knight with an eloquent recounting of their prior achievements, listing their colours in the archaic language of heraldry (red is gules, black is sable, and so on). Each knight even has a personal motto — from “all resistance is futile” to “my hope is in God” and even “don’t panic”. Even for those who aren’t completely history-obsessed, the joust offers pure spectacle. Despite the herald’s voice booming over a very modern speaker system, the television cameras set up around the arena and the drone capturing all the action from above, watching the knights thunder down the lists in clouds of dust really does feel like inhabiting a pocket of history. The Faire is rather strict on this aspect, basing its joust off 15th Century protocol. The Knight Marshal wears traditional livery in his role of scoring the joust from the field, and each knight is required to have two attendants attired in suitable medieval garb. Even the non-reenactors working around the arena wear parti-coloured tunics above their steel-capped work boots. 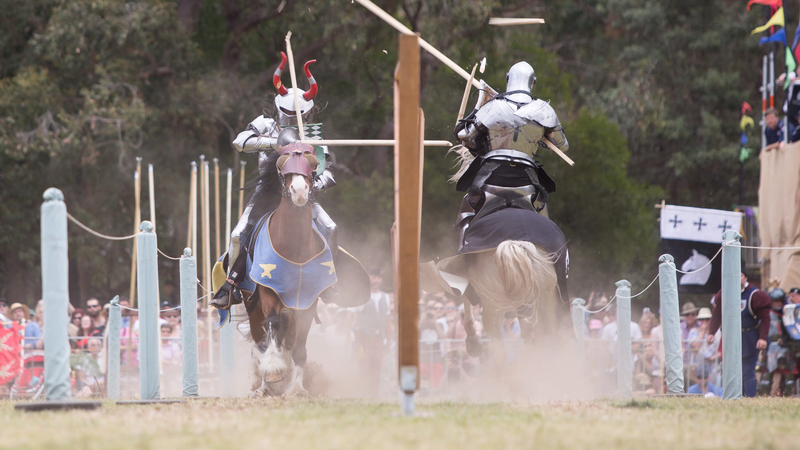 “Knights wear historically accurate armour that weighs around 40kg and charge at opponents astride a horse at a combined speed of 40 km per hour, all this looking through a 5mm slit in a helmet,” said the tournament’s organiser Andrew McKinnon, a jouster himself. But it’s not all dry history. Just like a real-life fantasy story, the eventual winner was also the crowd favourite — Australia’s local hero Sir Phillip Leitch, who had to come back from a distinct disadvantage to win the tournament’s ultimate prize, the Sword of Valour. Riding a stunning black Friesian stallion named Valiant (who has his own Facebook fanpage), Phillip was more than happy to show off for the excited crowd, prancing, galloping and rearing for the pair’s many fans. Other knights impressed with their armour — most held to the old tradition of having a giant, impractical construction on the top of their jousting helmets, depicting everything from winged archangels to dragon’s heads. At one point, the marshals threatened to report a competitor to the RSPCA for knocking a wooden seagull from the top of his rival’s helm. Indeed while jousting is becoming an increasingly serious sport, it hasn’t yet fallen into the trap of taking itself too seriously. The whole event was made more entertaining by the ever-present commentary of the herald. He taunted the visiting knights about Australia’s sweltering spring weather and applauded them for acts of chivalry in equal measure, all the while deciphering the scoring for the modern crowd — and never once breaking character. Peering over the heads of other curious spectators, cheering for my favourite knights and wincing as lances snapped against shields and armour with deadly force, I felt like I was part of a piece of true living history. It was surprising, on that hot spring day, to find this ancient sport in the middle of a huge resurgence — and even more surprising to discover Australia at its forefront.